Dogs Bite Decatur Al: BROOK PARK OH - A PIT BULL 'SOMEHOW' GOT LOOSE AND IMMEDIATELY FOUND SOMETHING TO KILL...A YORKIE BEING WALKED BY ITS OWNER!!! BROOK PARK OH - A PIT BULL 'SOMEHOW' GOT LOOSE AND IMMEDIATELY FOUND SOMETHING TO KILL...A YORKIE BEING WALKED BY ITS OWNER!!! A loose PIT BULL attacked and killed a Yorkshire terrier last week on Sheldon Court, a small residential street south of Holland Road. The terrier's owner was walking the dog when the attack occurred at about 12:15 p.m. April 24. The owner broke a wrist trying to separate the pit bull from the terrier. At least one witness also tried to stop the attack. Police said the pit bull lived on Sheldon and had broken loose from an enclosure in its family's yard. The terrier was taken to a veterinarian after the attack. The pit bull was taken to the Brook Park Animal Shelter for observation. Alex Perkins, Brook Park's chief animal control officer, could not be reached Friday regarding the status of the pit bull, or if the pit bull's owners had been cited. Some communities, like Lakewood and Parma, ban pit bulls, although pit bull supporters have protested those laws, saying the animals are not naturally vicious. Last year, Shaker Heights considered a pit bull ban after Annie Williams, a 71-year-old Cleveland grandmother, was mauled to death by a pit bull while she was visiting a family member in Shaker Heights. In November, more than 130 people crowded into Shaker Heights City Hall to oppose the proposed ban on pit bulls. 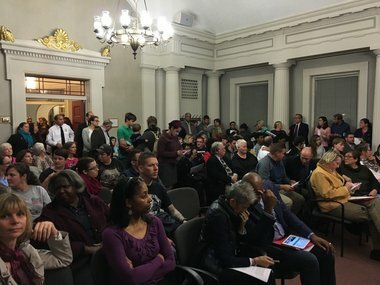 At Monday's meeting of Shaker Heights City Council, more than 130 people crowded into council chambers. Most of them were there to speak against the city's proposed pit bull ban. About 100 of the 130 present were out of town pit bull fanatics. When will city councils wise up?